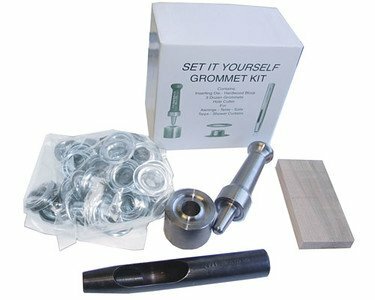 A complete and affordable Tools and Grommet kit for Home Hobby use. You will recieve: No. 235 grommet die, No. 245 belt punch, a small cutting board , complete instructions and No. N1-5 Nickel Plated Brass size 3 Grommets. Size 5 grommets have a 5/8" diameter hole when set in, 1.205" out side diameter, and 0.330" Length under flange . No. 245 - Belt Punch has a Round shank. Hardened cutting edge - milled clearing hole. If you have any questions about this product by C. S. Osborne & Co., contact us by completing and submitting the form below. If you are looking for a specif part number, please include it with your message.